“Silicon-based system offers smaller, cheaper alternative to other “broadband” filters; could improve a variety of photonic devices. MIT researchers have designed an optical filter on a chip that can process optical signals from across an extremely wide spectrum of light at once, something never before available to integrated optics systems that process data using light. The technology may offer greater precision and flexibility for designing optical communication and sensor systems, studying photons and other particles through ultrafast techniques, and in other applications. Optical filters are used to separate one light source into two separate outputs: one reflects unwanted wavelengths — or colors — and the other transmits desired wavelengths. Instruments that require infrared radiation, for instance, will use optical filters to remove any visible light and get cleaner infrared signals. Existing optical filters, however, have tradeoffs and disadvantages. Discrete (off-chip) “broadband” filters, called dichroic filters, process wide portions of the light spectrum but are large, can be expensive, and require many layers of optical coatings that reflect certain wavelengths. Integrated filters can be produced in large quantities inexpensively, but they typically cover a very narrow band of the spectrum, so many must be combined to efficiently and selectively filter larger portions of the spectrum. Researchers from MIT’s Research Laboratory of Electronics have designed the first on-chip filter that, essentially, matches the broadband coverage and precision performance of the bulky filters but can be manufactured using traditional silicon-chip fabrication methods. “This new filter takes an extremely broad range of wavelengths within its bandwidth as input and efficiently separates it into two output signals, regardless of exactly how wide or at what wavelength the input is. That capability didn’t exist before in integrated optics,” says Emir Salih Magden, a former PhD student in MIT’s Department of Electrical Engineering and Computer Science (EECS) and first author on a paper describing the filters published today in Nature Communications. Paper co-authors along with Magden, who is now an assistant professor of electrical engineering at Koç University in Turkey, are: Nanxi Li, a Harvard University graduate student; and, from MIT, graduate student Manan Raval; former graduate student Christopher V. Poulton; former postdoc Alfonso Ruocco; postdoc associate Neetesh Singh; former research scientist Diedrik Vermeulen; Erich Ippen, the Elihu Thomson Professor in EECS and the Department of Physics; Leslie Kolodziejski, a professor in EECS; and Michael Watts, an associate professor in EECS. The MIT researchers designed a novel chip architecture that mimics dichroic filters in many ways. 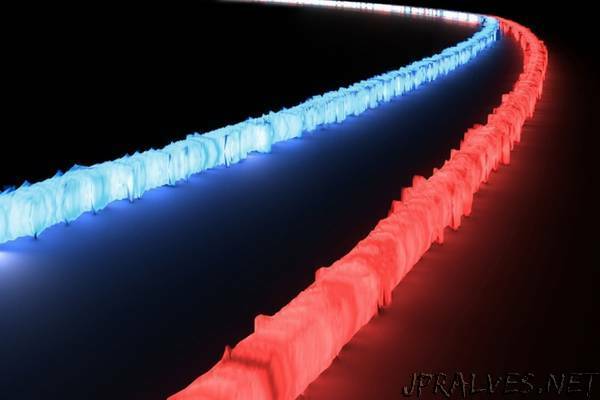 They created two sections of precisely sized and aligned (down to the nanometer) silicon waveguides that coax different wavelengths into different outputs. Waveguides have rectangular cross-sections typically made of a “core” of high-index material — meaning light travels slowly through it — surrounded by a lower-index material. When light encounters the higher- and lower-index materials, it tends to bounce toward the higher-index material. Thus, in the waveguide light becomes trapped in, and travels along, the core. The MIT researchers use waveguides to precisely guide the light input to the corresponding signal outputs. One section of the researchers’ filter contains an array of three waveguides, while the other section contains one waveguide that’s slightly wider than any of the three individual ones. In a device using the same material for all waveguides, light tends to travel along the widest waveguide. By tweaking the widths in the array of three waveguides and gaps between them, the researchers make them appear as a single wider waveguide, but only to light with longer wavelengths. Wavelengths are measured in nanometers, and adjusting these waveguide metrics creates a “cutoff,” meaning the precise nanometer of wavelength above which light will “see” the array of three waveguides as a single one. In the paper, for instance, the researchers created a single waveguide measuring 318 nanometers, and three separate waveguides measuring 250 nanometers each with gaps of 100 nanometers in between. This corresponded to a cutoff of around 1,540 nanometers, which is in the infrared region. When a light beam entered the filter, wavelengths measuring less than 1,540 nanometers could detect one wide waveguide on one side and three narrower waveguides on the other. Those wavelengths move along the wider waveguide. Wavelengths longer than 1,540 nanometers, however, can’t detect spaces between three separate waveguides. Instead, they detect a massive waveguide wider than the single waveguide, so move toward the three waveguides. “That these long wavelengths are unable to distinguish these gaps, and see them as a single waveguide, is half of the puzzle. The other half is designing efficient transitions for routing light through these waveguides toward the outputs,” Magden says. The design also allows for a very sharp roll-off, measured by how precisely a filter splits an input near the cutoff. If the roll-off is gradual, some desired transmission signal goes into the undesired output. Sharper roll-off produces a cleaner signal filtered with minimal loss. In measurements, the researchers found their filters offer about 10 to 70 times sharper roll-offs than other broadband filters. As a final component, the researchers provided guidelines for exact widths and gaps of the waveguides needed to achieve different cutoffs for different wavelengths. In that way, the filters are highly customizable to work at any wavelength range. “Once you choose what materials to use, you can determine the necessary waveguide dimensions and design a similar filter for your own platform,” Magden says. Many of these broadband filters can be implemented within one system to flexibly process signals from across the entire optical spectrum, including splitting and combing signals from multiple inputs into multiple outputs. This could pave the way for sharper “optical combs,” a relatively new invention consisting of uniformly spaced femtosecond (one quadrillionth of a second) pulses of light from across the visible light spectrum — with some spanning ultraviolet and infrared zones — resulting in thousands of individual lines of radio-frequency signals that resemble “teeth” of a comb. Broadband optical filters are critical in combining different parts of the comb, which reduces unwanted signal noise and produces very fine comb teeth at exact wavelengths. Because the speed of light is known and constant, the teeth of the comb can be used like a ruler to measure light emitted or reflected by objects for various purposes. A promising new application for the combs is powering “optical clocks” for GPS satellites that could potentially pinpoint a cellphone user’s location down to the centimeter or even help better detect gravitational waves. GPS works by tracking the time it takes a signal to travel from a satellite to the user’s phone. Other applications include high-precision spectroscopy, enabled by stable optical combs combining different portions of the optical spectrum into one beam, to study the optical signatures of atoms, ions, and other particles. In these applications and others, it’s helpful to have filters that cover broad, and vastly different, portions of the optical spectrum on one device. “Once we have really precise clocks with sharp optical and radio-frequency signals, you can get more accurate positioning and navigation, better receptor quality, and, with spectroscopy, get access to phenomena you couldn’t measure before,” Magden says.